Misguided management is stifling growth at Philadelphia’s food-and-facilities giant Aramark, according to two Wall Street analysts who want an activist investor to step up and push out the current leadership. Aramark Corp. is a giant in the world of food and support services, but the company’s 3 percent annual revenue growth significantly lags that of its largest rival, Compass Group PLC, for one main reason. It doesn’t win enough when it competes against Compass and others for long-term contracts to run dining services for schools, universities, hospitals, and other businesses, Dan Dolev and Sean Kennedy, analysts at Nomura Instinet, argued in a March 18 report. The rebuke by Dolev and Kennedy comes as Aramark shares have underperformed the Standard & Poor’s 500-stock index and Compass over the last five years, and follows a period of turmoil this year caused by the decision to not pay annual bonuses to thousands of lower-level managers. Aramark blamed a company-wide profit criteria — but the managers were never told in advance about that. The analysts don’t see much changing under the current management team of Eric J. Foss as chief executive and Stephen P. Bramlage Jr. as chief financial officer, because the financial incentives aren’t aligned with long-term growth at the company. 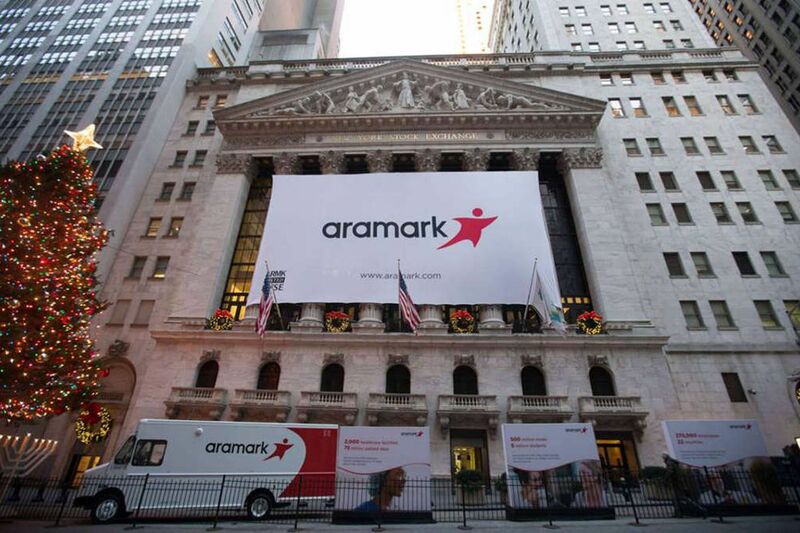 Dolev and Kennedy told The Inquirer that they would like to see an activist investor take a large position in Aramark and say “enough is enough, and push management out,” because “they are definitely not leveraging the full power of the business." Aramark responded with CEO Foss’ familiar investor pitch: The company has significantly increased revenue growth rates in the five years since going public in 2013. That growth translated into “industry-leading” earnings growth from 2013 to 2018 and landed Aramark among “a handful of companies” with double-digit percentage gains in adjusted earnings per share for five consecutive years. After returning to the stock market in December 2013 at $20 per share after six years of private-equity ownership, Aramark’s shares went mostly up, reaching a peak of $46 in January 2018, but since then they’ve fallen 37 percent, closing Friday at $28.91 on the New York Stock Exchange. When Aramark in December cut its target for annual revenue growth to a range of 2 percent to 4 percent from 3 percent to 5 percent, analysts were puzzled, especially because Aramark estimates overall annual growth in its end markets at 3 percent, and Compass tells analysts to expect annual revenue growth in the range of 4 percent to 6 percent. Sodexo, based outside Paris, is a third major competitor for food services. Compass is the biggest, with $30 billion in revenue last year. Sodexa was at $23 billion, while Aramark was at $16 billion. Aramark Corp.'s stock price is down about 8 percent since the beginning of 2016, lagging the performance of Compass Group PLC and Sodexo, its two principal competitors. The chart below shows the percentage change in the stock price of the three companies since Jan. 4, 2016. “Why do you not see Aramark being able to gain share based on some of the improved brand position and the improved scale that you now have?” asked Harry Martin, an analyst at Sanford Bernstein & Co., during the Dec. 11 investor day. If the company were taking market share from others by winning new business, Aramark’s revenue would increase faster than the market as a whole. Schlomo H. Rosenbaum, a Stifel, Nicolaus & Co. analyst, told Foss and Bramlage at the same meeting that he was “just trying to get my hands around” why the expected growth rate was not accelerating after acquisitions and years of technology investments. Foss said Aramark’s primary goals of growth in earnings per share and higher profit margins can be achieved without higher revenue growth. “The way the machine works does not require us to drive 5 percent or even 4 percent revenue growth,” Foss said. “I don’t think he understands what investors like," Dolev said. "Investors want organic growth. He’s going for some margin by cutting spending on food and support.” Dolev and Kennedy estimated that between fiscal 2016 and fiscal 2018, Aramark cut its spending on food by anywhere from 0.2 percent to 2 percent when it should have spent any savings on better food offerings. “Food has become more of a novelty. Plain old food to be fed is not enough anymore,” Dolev said. Elsewhere, Bramlage has said the company does not grow faster because it needs to carefully balance spending money to win new clients with generating cash to reduce its heavy debt load. “I don’t think that’s the reason. To me that’s just like an excuse,” Dolev said. Both Compass and Aramark gain about 2 percent in revenue annually from existing operations and lose 4 percent or 5 percent of revenue when clients chose new providers, Dolev and Kennedy said in their report. The big gap is in revenue from new contracts. At Compass, that growth has been around 9 percent for the last two years, public reports show. Aramark does not include that information in public presentations, but Dolev and Kennedy said Aramark revenue gain from new contacts has been around 5 percent to 6 percent in the last three years. New business comes from organizations that are outsourcing for the first time or is taken from competing food-service providers. Aramark took a hit on both counts when in 2017 Inspira Health of South Jersey chose Compass over Aramark to provide food and cleaning services at its three hospitals. Inspira itself had managed the services in Elmer and Vineland; Aramark had been the provider in Woodbury. “We selected Compass not only on price, but we also thought some of their values that they brought to the table, and of the priorities that they have as a corporation, matched and mirrored ours around patient safety, around quality, around the patient experience,” said Todd Way, Inspira’s executive vice president of operations. Management incentives are part of the problem at Aramark, Dolev and Kennedy said. Only half of Aramark’s long-term incentives are based on core financial measures. The remainder consist of share-based compensation that unlocks over time rather than based on meeting targets, the analysts said. At Compass, by comparison, 80 percent of the top executives’ long-term incentives are based on core financial measures and 20 percent on total shareholder returns. At Compass, the executives get no annual and no long-term incentive payout if only the minimum threshold is met, according to the company’s annual report. Last year Foss, Bramlage and other top Aramark executives collected 77 percent of their annual bonus target after Aramark’s adjusted operating income landed precisely on the minimum threshold — $974.5 million — needed for top executives to receive an annual bonus. That amounted to $2.6 million for Foss and $546,900 for Bramlage. For thousands of low-level managers who met the financial targets they knew about but still got no bonus, that stung. As a group, investors two years in a row have panned Aramark’s executive pay practices in their annual non-binding “say on pay” vote. The approval rate climbed to 55.8 percent at this year’s annual meeting from 50.7 percent last year, according to Aramark’s SEC filings. Mary J. Mullany, a Ballard Spahr LLP partner whose specialties include executive compensation, said that’s still a failing grade. “If you get less than 80, you’re in trouble,” she said.